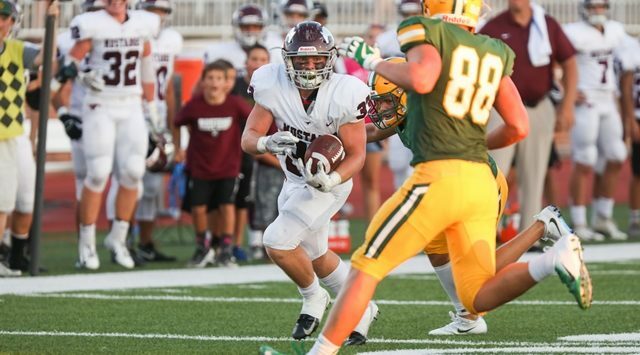 A week ago, Salina Central tailback Taylon Peters terrorized his crosstown rival. The senior had quite the encore on homecoming night. Peters ran for over 200 yards and six touchdowns, Central’s defense forced six turnovers, and the Mustangs powered past Hutchinson, 62-20, on Friday at Salina Stadium. Central improved to 3-0 at home, beating Hutch for first time since 2014. The Mustangs also put up 60-plus points for the first time since Oct. 31, 2008, when SC throttled Topeka West 65-21. Central set the tone on the opening drive, targeting senior Riley Counts three times. The third pass went for six as Counts caught the ball on a wide receiver screen and took it 33 yards to the goal line. On the ensuing kickoff, Hutch bobbled the ball, recovered by SC, but the ‘Stangs were unable to capitalize. No worries, though, as the Salthawks committed four more turnovers in the half. That allowed Peters to run free, scoring on a pair of one-yard plunges and a 25-yard scamper. Junior quarterback Jackson Kavanagh set two of those three TD rushes up before finally finding the end zone on a 19-yard strike to senior Ben Driver. Hutch scored just before the break on a four-yard sprint by Tayezhan Crough, making the score 35-6 at halftime. Peters didn’t slow down in the final two frames, scoring on runs of 13, 37 and 58 yards. The sensational senior finished with 256 yards and six touchdowns on 22 carries. Kavanagh ran for 70 on 11 totes. He also was 8-of-10 for 122 yards and two scores. SC had 467 total yards on 48 plays. Defensively, Driver ended up with 15 tackles while Michael Russell had 13. Greg Gibson settled for six, but was also named 2018 homecoming king.